Christmas Eve day and the Fourth Sunday of Advent gives us a concentrated and shortened season to prepare for Christmas, to prepare for the Nativity of our Lord. 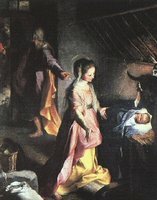 The Bible readings we share today provide us the promise of Christ’s birth in Bethlehem and the visitation of the pregnant, yet Virgin Mary to her elderly and expectant cousin. It is in the greeting of Mary with Elizabeth that we receive the second joyful mystery of the most Holy Rosary. This Visitation in which the baby within Elizabeth’s womb recognizes the Holy Child just conceived within Mary’s womb, the infant Jesus, provides us the promise and lesson for this day. One of the blessings and mysteries of the Incarnation is that the infinite, eternal God, would, in His timeless love for humanity , cross the threshold of eternity to become human to, share our times. But it is also in the Incarnation that Jesus, God come in the flesh, brings us to Him, Christ, God eternal. It is into this timeless relationship that we are called by Christ today. It is in a story from another time and place that we may perhaps better understand and experience this joy. The early Franciscans received from their brother Francis a deep love and reverence for the infant Jesus. The Christmas crèche, the Nativity scenes we have in our church and homes comes from St. Francis himself as he sought to awaken anew the truth and power of the incarnation with the village of Grecio. Although probably started earlier and elsewhere it was by St. Francis that this awesome tradition was established. This love of the infant Jesus was deeply cherished by another saint and follower of Francis, St. Anthony of Padua. Its is from his life we share our main lesson. Anthony was on a mission to France. His preaching, prayers and loving holiness was touching and moving many hearts to a deeper and renewed love for Christ and His Church. Amongst these people was the French Lord of Chateau-neuf-de-Foret (Spring, 1226). This lord was of a powerful, prominent family. He well knew privilege, place, power and wealth. And he had also come to the heart-rending realization that all of it brought no fulfillment. Through the friendship of Anthony his faith and love for Christ had grown. 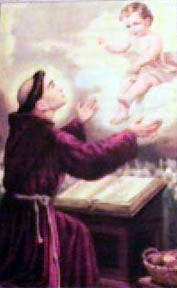 This friendship had brought St. Anthony to stay with the lord for a short while to work on his studies and writings. And so it was, one night the lord had been praying in the his small private place of prayer. Finishing his prayers he was walking down the hall to his room expecting to see the flicker of candlelight from the room Anthony was staying. He was astounded at the bright light coming from under the door and even more flummoxed to hear the sound of an infant child giggling and chattering. How could this be? There were no children of any age in the Chateau. Looking through the large keyhole the lord was astounded. Anthony was at his table with an open Bible and another large book. Upon the book sat a very young child that immersed the room in the intense, beautiful light. Playing, giggling, talking and embracing the Christ Child and Anthony are seen in the power and joy of Heaven. The infant, in Anthony’s arms stops, points to the door and whispers into the ear of the simple, holy believer. The Christ then vanishes and Anthony goes to the door and greets the lord of the chateau, admonishing him to not share this event until after Anthony dies. There are varied versions of this story, placing it at other locations. And, of course, some modern historians would question the veracity of the account. What, if any, is the message for us this fourth Sunday of Advent? The message is simply the timeless longing for Christ to be . In the Scriptures we see that longing in the prenatal encounter between John the Baptist and Jesus. 1200 plus years later we see the infant playing with and being with Anthony and sharing His message with the lord of the chateau. Today, 2000 years later, Jesus longs for you with that same love that time cannot contain. Is the story of St. Anthony and the Christ child true? The details are unclear, to be sure. Yet the encounter has all the strength of the truth of our Savior’s love. Did Anthony love Christ? Yes. Did Anthony love, embrace and rejoice in God’s Word? Yes. Would Anthony have held the Word of God, incarnate in his arms, rejoicing. Yes. But I would ask that you simply find out for yourself. This Christmas allow yourself to enter anew into the humble faith known to Elizabeth,the Virgin Mary, Francis and Anthony. Hold and trust the living Word of God in your Heart. Receive in humble contrition His sacred Body and Holy Blood. It is as we look to Him in faith that we will know the joyful embrace of His love and the power of the whisper of His Word.